Collaborating with educators to develop job search marketing packages to stand out and advance their career is our expertise. However, we don't just write teacher resumes! I am sure we have written documents in every occupation or position title. Surprise us, if you can! If you are tired of wasting time figuring out the art of writing a resume for a teaching job, or overcoming career obstacles, contact us for resume writing help to secure interviews. and everyone else in the education field! We pride ourselves on writing tailored teacher resumes to communicate the unique value you bring to a school district or organization. Customer service is paramount to us. We make sure you are looked after in a timely and professional manner. Treat others as you would expect to be treated is our motto and we stand by it. We provide service via email or over the phone, whichever suits you best. Your success is our success! I was VERY pleased to work with Candace. Her resume generated more than ten interviews, and I could move from being a Spanish Teacher to a Technology Teacher. I recommend her to anyone who is looking to have a professional resume, cover letter, and philosophy of education. She rocks!!! Your career success is our priority. It's our passion and expertise! You know you’re a knockout educator, so why can’t you land a teacher interview? The competition can be tough! You MUST showcase your credentials, skills, and expertise in the right manner. 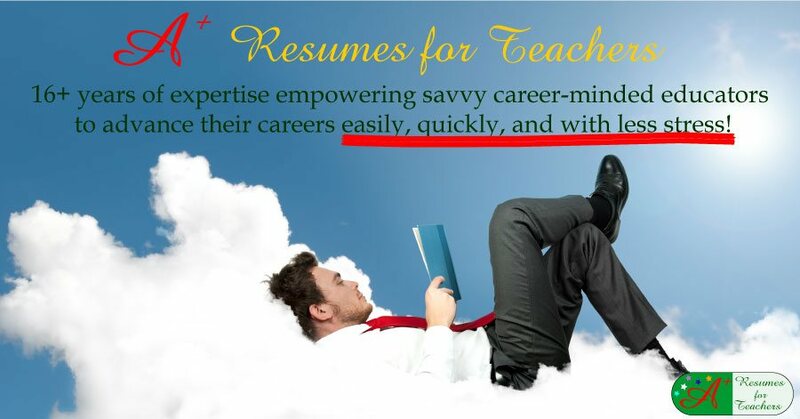 As a specialized teacher resume writing service, we know what works and will position you ahead of your competition. Shop around - is there another Dual Certified Professional Resume Writing Service that specializes in education resumes and curriculum vitaes? Over the last 16+ years we have developed approx. 8500 academic resumes, curriculum vitaes / CVs application letters, LinkedIn profiles, teaching philosophy statements, and other job search documents in the education industry. "Candace took the time to get to know my personal strengths and goals as an educator. With that information, she developed a resume and cover letter that fit me perfectly.Both the resume and cover letter got a lot of attention when sent to various employers. Next year I will be teaching abroad in my dream job"
A+ Resumes for Teachers guarantees 100% satisfaction. See our testimonials and find out why our clients enjoy partnering with us. Here are some other reasons why you should hire us to help you advance your education career. Time Tested - Successfully helped teachers, administrators, and other educational professionals around the world for 16+ years secure excellent positions quickly, easily, and with less stress. Proven Performance - Backed up with a top-notch guarantee, extensive testimonials, and a high referral rate. Unique Job Search Documents - No Teacher Resume Templates - Customized resume and cover letter that will enhance and showcase YOUR qualifications and accomplishments. Worldwide Resume Writing and Interview Coaching Service - The majority of our clients come from the United States, therefore our pricing is in U.S. currency. However, we enjoy working with international clients, and have developed compelling job search documents for customers around the globe. Customer Service Focused - We want you to be happy with the final results. This includes making any necessary revisions until you are 100% satisfied. No Hidden Costs - We list resume writing services and pricing on the website, so you know what your investment is right from the start. Secured Server - Get started right away. Within minutes you can have the education specific worksheet delivered right to your email box as an MS Word attachment. Expertise - We can help you with every aspect of your job search. Candace has earned the following credentials and is a Dual Certified Resume Writer. Learn more about Candace Alstad-Davies. CECC Certified Electronic Career Coach. Numerous courses on Twitter, Facebook, LinkedIn, Pinterest, Google+, Instagram and how they relate to job search and growing contacts or followings. Confidential Service - we are very discreet when contacting clients; be assured your personal information will never be shared. We have an education specific development team plus two "Certified" Professional Resume Writers to review your completed documents. You’ll be thrilled to know that our career experts understand and speak educational "lingo;" they know the teaching structure and work concepts of the education system. We offer you modern resume writing techniques and up-to-date keywords; in other words, we know what works and what doesn't. We are knowledgeable about the education and career trends, buzzwords and language that are specific to your profession. These words are essential to optimize your job search, and need to be incorporated in your education resume, cover letter, and LinkedIn profile. Without them, your teacher resume will not pass the ATS scanning process that many schools, organizations, businesses and faculties are using to screen applicants - it will not be placed in the "to be interviewed pile." Don’t put off your dream teacher, school administrator, or any other education career, let us help move your career forward! Review our resume and cover letter samples. If you require more information or have any questions - Contact Candace at candoco@telus.net or call toll-free 1-877-738-8052.